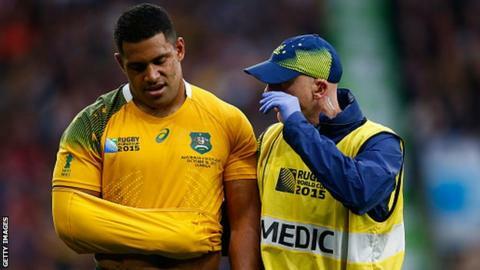 Australia have recalled prop Scott Sio in their only change for Saturday's World Cup final against New Zealand. Sio is fit after missing the semi-final win over Argentina with a damaged elbow and replaces James Slipper. Full-back Israel Folau, who has been battling an ankle injury and only lasted an hour against Argentina, has been cleared to play. Veteran inside centre Matt Giteau, who hurt his groin playing against the Pumas, is also able to start. Giteau, 33, is the lone survivor from Australia's last World Cup final - the 2003 defeat by England. The Wallabies are preparing for a record-equalling fourth World Cup final. "We'll be doing our best to make Australia proud of its rugby team," said head coach Michael Cheika. "This week we've had a strong focus on improving certain areas in our game where we feel we haven't been at our best in the previous matches. "We still have lots of scope to improve and we'll work on that before this next match against New Zealand." Australia's match-day squad of 23 has a combined 1,205 caps, compared to New Zealand's 1,339 caps. With Sio fit, reserve prop Toby Smith misses out on a place on the bench. The Wallabies are looking to win the World Cup for the third time after previous successes in 1991 and 1999. Australia team to face New Zealand: Israel Folau; Adam Ashley-Cooper, Tevita Kuridrani, Matt Giteau, Drew Mitchell; Bernard Foley, Will Genia; Scott Sio, Stephen Moore (captain), Sekope Kepu, Kane Douglas, Rob Simmons, Scott Fardy, Michael Hooper, David Pocock.